Why Do Thermal Pane Windows Fail? Every double pane window eventually fails. There is no such thing as a fail-proof thermal pane window. Wood framed windows tend to last 20 to 24 years (if well maintained). Newer, high-end wood/aluminum clad windows last about this long too. Traditional aluminum frame windows typically last 17 to 20 years. Vinyl framed windows may make it 15 years if they have standard box spacers. However most newer vinyl framed windows have a low-quality Intercept Spacer and these windows begin failing in 5 to 8 years. Sunshine is the biggest cause of window failure, which is why your south and west facing windows usually fail first. Sunshine causes both a process known as “solar pumping" and the hardening of the sealant that forms the seals of the window. When sunshine hits a double pane window the air inside heats up significantly, (think of a car on a hot day!) 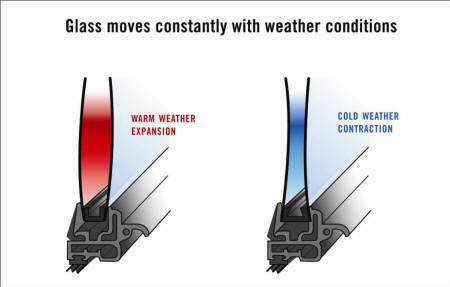 causing the sealed window unit to expand and pushing air out through the semi-permeable seals. In the evening, the window cools and contracts, drawing air—and humidity—with it. Day after day, year after year, this cyclical expansion and contraction occurs, stressing the window seals and filling the air space with moisture. Manufacturers expect and plan for solar pumping. Built into every thermal pane window frame is silica desiccant to absorb the small amounts of moisture inevitably drawn into the window. The desiccant, however, has a limited capacity and lifespan. In a standard box spacer the desiccant looks like the photo below. 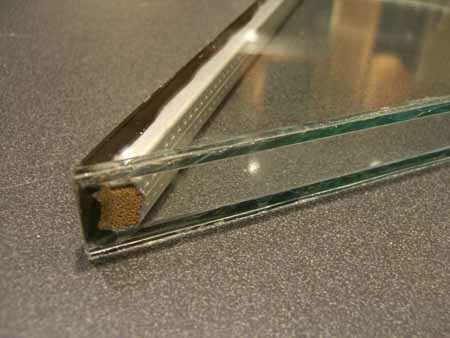 In an Intercept Spacer, the desiccant is mixed into the sealant that forms the seal of the window. At some point the desiccant will have absorbed all the moisture it can hold and that is the day a hazy, misty bluish fog clouds your glass window pane. From this point on the window begins deteriorating rapidly. If left untreated, the trapped moisture quickly corrodes the inner window glass surfaces, eventually leaving mineral deposits and a permanent white silica haze. So your window can go from just a bit of a blue haze, to fog in the window, to mist and finally a thick opaque white haze. 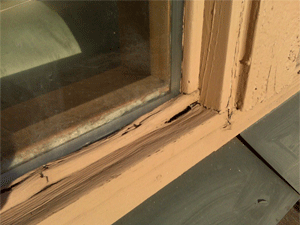 The biggest cause of early failure in wood framed windows is lack of maintenance. Every two years the exterior seam where the glass meets the wood needs to be caulked and the frames painted. Otherwise, rain hits the glass and runs down between the wood and the glass, pools at the bottom of the IGU (Integrated Glass Unit) and rots both the seal of the IGU and the wood frame of the window from the inside out. 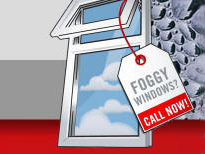 Once the seal has failed haze, fog and eventually a mineral deposit will develop in your window. Anything that makes a window hotter also will shorten it's life. Use external sunshades rather than inside drapes to protect the window from heat. Be aware that solar film--while useful in many places--significantly increases the heat inside a window and always voids the manufacturer's warranty for the window. Read our article on 10 Things Every Homeowner Should Know About Windows to learn more of the inside story on your windows.